Omote, Ura and On: ERASED, Hanasaku Iroha and the Mother-Daughter Conflict | UEM! But when we look across cultures, there is no single idea of ‘family’ that unites the world; household relationships are as much a product of our culture and society as the stories we tell about such structures. The families we see in anime are often readily understandable as though they were from the West, but there are details that become exposed when we tackle these stories with sensitivity to the way Japan thinks about its own families and social codes. A great case study of this can be made from mother-daughter relationships in anime – specifically, the conflicts that abound and threaten or cause the separation of parent and child. Mahōtsukai no Yome launches its tale from one mother’s death to another mother’s inadvertent torment of a child who sees the world in scary ways; both cases place the worlds of mother and child apart and incompatible. In Chūnibyō demo Koi ga Shitai, the daughter’s imagination is again what separates her from communion with her parents, though this is a conscious choice rather than something forced upon her; a resistance to parenting formed in the freedom of a fantastical existence and purpose to life. This pressure of repayment is something children must feel in most families, Japanese or not, while it has particular prevalence in Japanese culture. But conflicts can arise when a child chooses to not be driven by this idea of reciprocity. While Mahōtsukai no Yome saw Chise unable to repay such on because no mother would accept her, the gift of life and shelter is otherwise something we could consider invaluable and deserving of a lifetime of love in return, even if something rocks the parent-child boat. Even then, love within a Japanese household has its own unique quirks. The idea of public and private faces is codified in Japanese society through the concepts of omote and ura, the ‘back’ and ‘front’ of one’s persona. In old Japanese they mean ‘face’ and ‘mind’ respectively (Takeo Doi, 1973: 259). The former is a public face, a performed Self constructed as a mask. The latter is the bare Self with no façade to cover any of its beauty or shame. These concepts explain the ideal of the “outer passivity and inner strength in Japanese women” (Brannen and Ramsey, 1979: 481) of Japan’s middle-class society; though there’s been progress away from such strict modelling of women up to this day. The privacy of ura doesn’t mean it’s always let loose in the household, however; customs of respect to parents follow omote as well. When we see omote breaking, for better or worse, there is a greater transgression in for the Japanese family. Takeo Doi has emphasized how this kind of two-fold consciousness, which he acknowledges as universal, is “cultivated to an unusual extent in Japan so that it has become a definite pattern of living” (Takeo Doi, 1973: 258). Tsundere-types operate on discordant omote to hide their vulnerable ura. When Hachiman cries out ‘I want something real’ in the second season of Oregairu, he speaks into a sea of omote to present a plea for ura. These dual concepts can be incredibly illuminating for Japanese characterization. Alongside more global observations of motherhood, daughterhood and their relational structures, I want to use these concepts of on, omote and ura in an analysis of two dysfunctional mother-daughter relationships. The abusive motherhood in ERASED and the supplanted motherhood in Hanasaku Iroha will help us explore how lines between mother and daughter are drawn in the drama of these stories; how mothers are also daughters, and how their navigation between positions of child and parent, through the above notions of reciprocity and self-performance, can uncover what’s beneath the surface of problematic parenting. For those familiar with ERASED, Kayo’s predicament needs little introduction. Suffering the abuse of her mother, she comes to school with bruises that leak out her trouble back home. She doesn’t trust anyone, considering people ‘fakes’ in a nod to the opaqueness of omote. But rather than craft her own ‘fake’ omote to be coherent with her classmates, she moulds a mask of public seclusion. The failure of her household to offer a safe environment leads to her finding no safety in anyone; the failure of her mother to bring her up with household omote erases normative omote from her way of life. As a child, Kayo also lacks the ability to repay the on of her birth. Nothing she can do can ever satisfy her woman who gave her life. The climax of her struggle, once Satoru is given a second chance at saving her, comes after the confrontation of her mother at the hands of Satoru’s. 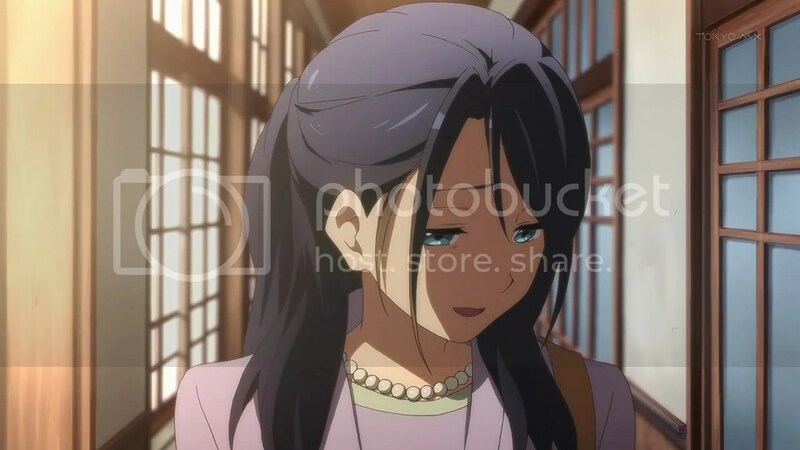 But this just stalls for time and ups the drama; the real denouement occurs when Akemi is confronted by her own mother. A character we only see for one scene, with no foreshadowing. No agency or identity other than being the undoing of everything Akemi has been so far. Everything we know about Ameki is at first through Kayo – her bruises, and her reactions to the violence itself in the scenes we witness it. Then, at the moment the ura of Akemi finally manifests – once her abusive omote is stripped away – we see her as not parent, but child. She must become a daughter herself again in order to see her wrong, and we see motherhood painted as a cycle; abusive motherhood a product of abused daughterhood. It’s a fitting notion for ERASED’s central theme of correcting the past, emphasising that present problems should be understood historically no matter how attractive immediate action may be. The appearance of Akemi’s mother expands the repair of the present through attendance to the past beyond the fantasy of time travel and into the fabric of our lives. The absolute shift from destructive parenting to a passive, regretful wreck at the introduction of the mother also plays with our expectations. 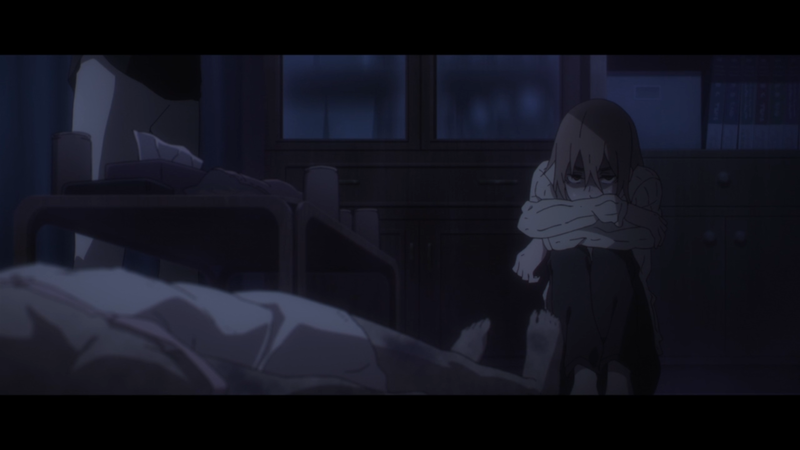 The agency of ERASED’s adult cast leads to the mother’s arrival, but from the perspective of Satoru Akemi’s character becomes completely consumed by her mother’s identity. We’re asked to be accepting, as Satoru is, of this notion that everything we build from the consequence of our mothering can be broken down once we look upon that mothering ourselves. We also learn how Akemi’s violence stems from the pain and abuse she received herself under her own roof. This keys into reciprocal on, but in a discordant sense. Rather than repay a debt, Akemi is unable to form a reciprocal relationship and tries to fill that void with her violence against the child now indebted to her, leaving Kayo in the same position. Inability to reciprocate on is reciprocated. Akemi’s warped motherhood suggests how faulting one household concept can lead to the disruption of another; the reciprocation of pain instead of care collapses omote and ura for Akemi, who is violent for the former (and thus contrary to its goals) and, as a mother, completely lacking in the latter. This furthers Lawler’s concern that mothers are always reduced to daughters once they speak. Akemi’s ura only manifests when she is placed once again in the position of child, and it is but a child’s ura. This is, again, fitting with ERASED’s overall sense of theme; the power of being reduced to a child, prevalent all the way up to Satoru’s cliffhanging scene with Yashiro. But this means Kayo’s removal from her mother is paralleled against the very undoing of her mother. While Marianne Hirsch ponders how mother and daughter could “inhabit the same body” to be “the same person, speaking with two voices” (Hirsch, 1989: 199), they cannot share Akemi’s body. Is the only way to fix a mother in the wrong taking the mother out of her entirely? ERASED’s plotline is effective, but it also suggests limitations of female agency in the household structure. To fix Akemi’s abuse, the mother is kicked out for the daughter to take center stage and be acted upon. We know Kayo needs a different mother, but her salvation comes with the absolute destruction of all of Akemi’s motherly identity. As much as we feel she deserves her emotional downfall, Akemi’s character arc reinforces an idea that mother and daughter are separate identities, and not in as much of a body-sharing flux or communion as Hirsch believes they can be. This mother-daughter paradigm does, however, bear an openness that correlates to the reform of the familial unit modern society has seen. Mieke de Wall has noted of Western families how parent-child structures have changed in recent years to open space for discussion and negotiation: in particular due to the fact that “if children still see parents as making unreasonable demands, more options to manage without their parents are now open through the institutions and organizations set up specially for them” (de Wall, 1993: 36). In ERASED Kayo has no ability to reach these institutions on her own. In fact, one institution she ought to be able to rely on, her teacher, turns out to be the greatest threat to her security. At first we see Satoru try to provide an alternative structure for her to have sanctuary in: the gang’s hideout works as a good metaphor for their secretive, parentless shelter. Satoru ultimately has to hand over responsibility for Kayo to professional services, but his work up to that point shows a desire for autonomy, the kind we indulge in while watching many moe shows filled with high school girls whose parents we barely see anything of. Before the moment of her loss of motherhood, Satoru’s solution to Akemi’s abuse, powerless himself to fix anything about her, is to build a new familial structure. This completely faults the idea of reciprocating on; Kayo is drawn away from giving anything back to the mother who gave her life, and Satoru’s new pseudo-familial unit doesn’t demand anything back from her. The liberation of Kayo is also the liberation of her from reciprocity; she marries who she chooses, not who fans think cause and effect should lead to. She also breaks the chain of abuse. Because she was extracted from the household unit, and because she had a new unit with new paradigms form around her and through her, Kayo can live her life far more independently than the demand of on upon her daughter-self should allow. If Akemi’s defeat arose from becoming a daughter once again, Kayo’s future seems established as an unbecoming, away from being anyone’s child. There are more changes in the family unit that open children up to independence. The increasing individualization of family members is a product of the increased emotionalization of family ties: “relationships between family members are increasingly and more exclusively defined as emotional relationships and are only valid within that framework” (Brinkgreve and de Regt, 1990: 331). To be a modern mother, in many households, is less of a permanent state of identity, and more of a performative persona. We see Sachike as motherly because she performs ideal motherhood, while we validate the removal of motherhood from Akemi because of her failure to meet the framework we set upon her. Here the idea of ‘mother’ reads in multiple ways: though literally a biological mother, all other notions of being a mother can be deducted from a character. We see this played out, along with other mother-daughter tensions, in Hanasaku Iroha. In many ways, Ohana’s relationship with her mother begins like an inversion. Ohana is calm, modest and collected: her veneer of respectful omote is thick and drapes every scene in irony as we see Satsuki fit the role of the rebellious teenage child, acting free as a bird with her boyfriend while Ohana cooks and cleans. The show begins with Ohana making a story about how she isn’t Satsuki’s child; after the attempt to rationalize their ersatz household, they joke about the ‘stork theory’ and ‘cabbage patch theory’ of birth, which both operate through models of non-paternal origin. Halfway through the series, in one flashback, Ohana tells Satsuki she should get her boyfriend to look after her. Saksuki replies by questioning if that’s something a daughter should say – while Ohana’s caretaking is motherly, her housework and demeanour are also a product of the reciprocation of on, and Satsuki plays into this, saying she isn’t acting daughterly. Ohana’s reply is striking: “You’re more of a ‘woman’ than a ‘mother’ to me,” she says. Satsuki takes the disowning lightly, but we can tell how heavily the untraditional relationship weighs on Ohana’s heart. Ohana’s mothering of Satsuki, and the wholesale inversion of their household, speaks of both Ohana’s independence from the normal ‘child’ role and her desire to still build normative structures under her family’s roof. Beyond her backstory, at the Kissuisō, it’s hard to consider her ethic reciprocal on when Satsuki can’t even keep a roof over her head. It seems like Ohana is the one trying to have Satsuki operate through a paradigm of repayment. As in ERASED, Satsuki develops when she adapts herself from half mother, half teenager, one-half-of-an-odd-couple into the position of a mothered child. Her scathing review of the Kissuisō, having not visited in ages, tips Ohana over the edge. When Satsuki eventually agrees to visit the inn, it’s because Ohana reminded her of herself when she was young. It’s quite a cliché in these sorts of stories: the mature woman, in the wrong, getting corrected by the blast from the past someone gives them. Once again the site of resistance to the problems of the present is found in the personal past. Once again the mother speaks, at the crux of the narrative arc, as daughter. But this time it’s the daughter and the mother that leads the woman to change. To Satsuki, Ohana and Sui really do inhabit the same body in an arresting way. Yet the lines are not as bluntly drawn for the mother-transformed as they were for Akemi. In the car ride following the announcement of her visit, Satsuki and Ohana maintain a typical mother-daughter dynamic. Satuski jokingly starts a conversation about Koichi leading to Ohana’s embarrassment. But at the same time, calling him ‘Ko-chan’ makes her sound on Ohana’s level. Later, as Satsuki smokes and talks with Tōru and reveals Ohana’s success, she also dwells on Sui’s care for her customers. “She’s got it right”, she says. “Yeah. Mum’s always right.” She wonders what it’s like for Ohana to have a mother who isn’t always right; one that rebelled against Sui in their youth because of their own kind of independence. In all this, she can’t shake her attachment to her family, to something that runs in the Shijama name. Drinking with Ohana and Sui, she considers the essence of her household to be putting work over love. But Sui then says that’s what marks her as outside the family, an echo of the disowning Ohana has expressed herself. Perhaps here it would be best to consider Satsuki as not mother or daughter or the two combined, but rather – letting out her ura through the power of alcohol – as at once unified with her family and happily taken out of the equation. Ohana is the daughter Sui wanted in Satusuki. Sui is the mother Ohana wanted in Satsuki. Satsuki is the failure to meet both their traditional demands, but she leads her own life and is proud of it. Hanasaku Iroha expresses pride in both preserving traditional household models and departing from them in this ersatz family unit. Satsuki can perform the mother-daughter, one or the other or both when needed, but she’s also a woman independent of family ties. That’s the freedom Sui embodies in the Kissuisō; by not attending to Satsuki’s room personally, and treating Ohana like she would any of her staff, Sui shows no preference for family over anyone else. It’s that freedom that Ohana reciprocates in her own way, in her treatment of Satsuki in the apartment and when she confronts her in Tokyo. All this comes together to form the great ironic beauty of Hanasaku Iroha: a family unit that rejects traditional family structures in ways that still maintain traditional household ideas. Through a strange kind of on, because Satsuki’s freedom meant drawing herself away from her household, Ohana’s reciprocation is played out through leaving Satsuki and finding comfort under Sui at the Kissuisō. To the Shijama family, the reciprocation of choice is better than repeating the same behavior or ideal. How much more dysfunctional would things have been is Satsuki had never left the inn! The Kissuisō prides itself in its attention to customers’ needs, and Hanasaku Iroha likewise places the individual above the system they’re born into. In the end Ohana’s promise to return to the inn is not her duty: it’s her choice. We saw in ERASED how the disruption of one formality led to the destruction of another. The cycle had to be broken, but that came from breaking away from static familial roles. Mother became daughter, and Kayo left her daughterhood behind. Hanasaku Iroha offers a similar but different image of how to mend social ties: Satsuki found her place as an independent inbetweener of the mother-daughter relationship formed between Ohana and Sui. On is returned to Sui rather than Satsuki, but Satsuki is comfortable with this dynamic, and free to do her own thing – as haphazard as her independent life may be. Thinking about the reciprocity and two faces of Japanese households highlights how deviant Kayo and Ohana’s lives are from the norm. Kayo ends ERASED set on establishing a family of her own, but without a grandmother-figure for her own child-rearing to reciprocate towards, what kind of family will she make? As Ohana ends Hanasaku Iroha wanting to be just like her grandmother, would her future child end up like her, or as another Satsuki? Kayo and Ohana appear liberated from relational systems while also ready to make use of them. Their agency above the social codes they matured under could be what’s really universal about living in a family. As an ideal, at least. This article was commissioned by one of my illustrious Patrons! Thank you, Kwan Yuk Sing, for your request! If you have a topic you’d like me to explore, or just a spare dollar for a student with no other source of income, please consider checking out my Patreon. Money can’t buy love, but it can grant access to better materials.